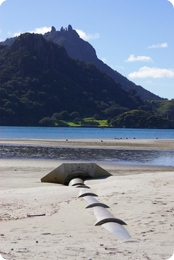 The design of sea outfalls should focus on the pipe diameters and gradients for drained sections of pipework which will run under open channel flow, depending upon the tidal conditions. In addition to this, care must be taken when selected storm pumps as they can potentially deliver a wide range of flowrates, depending upon the tide level and hence careful selection of the pump manufacturer is essential. Our studies will typically include design / optimisation of the diffuser to ensure an even flow distribution and we will consider transmural pressures in our modelling which are often neglected at the design stage, resulting in an overly conservative design.